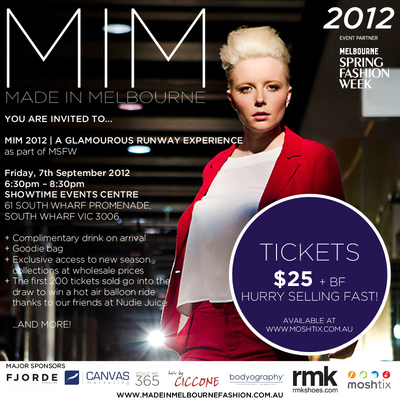 Melbourne Spring Fashion Week (MSFW) welcomes you to 'Be Inspired'! Lionel's Melbourne is set to dress up and party down from 3 September to 9 September with the 4 fresh faces of MSFW. In its 18 year, MSFW continues to support and grow the local retail and design industry through runway shows, exhibitions, education and increasing public awareness and recognition. The result of combined effort between the MSFW advisory board led by Glenys Shearer and local industry players, the city's fashion designers and retails have managed to rise about the difficult trading conditions to bring together a dynamic and exciting week of fashion, design and culture that is synonymous with Melbourne. This year program is jam-packed with activities to fill your fashion week calendar, from runways to parties, workshops to film, and high tea to high fashion. To help netizens navigate the fashion landscape, the City of Melbourne has introduced a smartphone application to alert you to what's happening where. I'm glad for the opportunity to preview all that's to come and be invited to the front rows and backstages of MSFW. So here's my essential guide to the week and the Best Things to See and Do at MSFW for time-deprived readers and fashionistas. Simply click on each headings for further details including descriptions, timings and locations. Fashion starts at City Square for FREE including runway shows by well-known brands, hair demonstrations and make-up workshops. This is your hub for MSFW. Come face-to-face with the works of 8 emerging designers through installation and a variety of formats, all free of charge at this week long exhibition in fortyfivedownstairs. Giving a leg up to Melbourne's fresh talent is part of MSFW ethos. Expect to be amazed by 7 emerging designers who are changing the future of fashion in their own individual way at Melbourne Town Hall. With 4 separate designer runway shows featuring more than 33 of Australia's premier designers at Melbourne Town Hall, you won't be short of trends, colours and ideas for your Spring/Summer wardrobe. What is MSFW without any films on the biggest names, trends and history of fashion? Australian Centre for the Moving Image (ACMI) have brought their 4th annual Fashion on Film collection to move the fashion firmament to a global level with these must-see films for any fashionistas. This series will allow you to learn from industry leaders on issues relevant to Melbourne's retail, fashion and design environment at Grand Hyatt Melbourne over breakfast. Hopping from one fashion event to another while trying to schedule in some retail therapy can be physically exhausting. The best way to keep the energy levels up during MSFW is by having small meals in between the fashion runs. More than 30 restaurants and cafes will help you to look, stop and taste some of the best cuisine Melbourne has to offer. Why? The awaited Melbourne Spring Fashion Week is finally upon us, bringing a full calender of shows, exhibitions, talks and films to bring out the fashionistas in everyone!